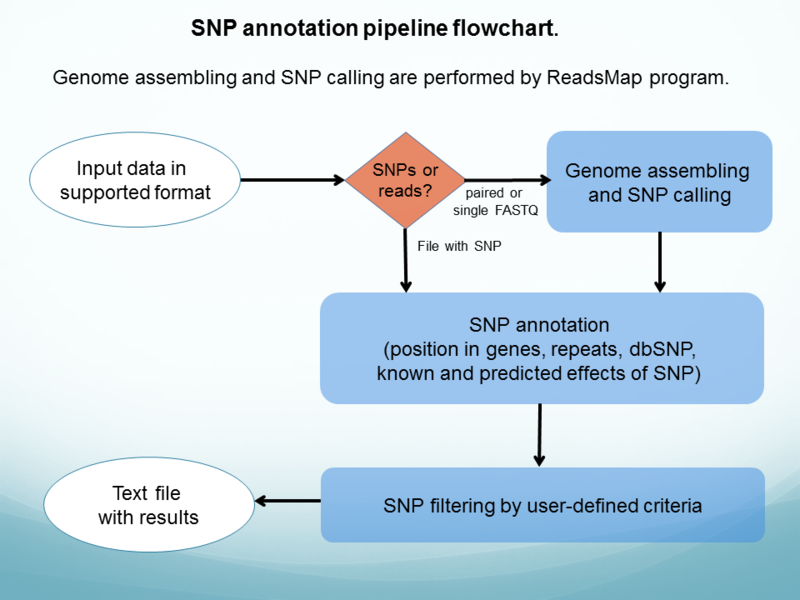 SNP effect annotates a set of human SNPs. Input data contains either genome reads or a list of variations in one of supported formats. Position numbering in such a list must correspond to GRCh37/hg19 genome assembly. Variations in output file can be filtered by user-defined criteria. The program evaluates single nucleotide polymorphisms (SNPs), multiple nucleotide polymorphisms (MNPs) and insertions and deletions (indels). Chromosome number, position on a chromosome, reference and observed nucleotides. Repetitive DNA element from UCSC database that contains an SNP. 5. For each gene containing a variation (human genes from UCSC database, fRNAdb database and genes which were predicted by FGENESH , predicted genes have IDs starting with FG_): its type (protein coding or not), database ID, orientation, position, and CDS range. Positions of all exons of a gene. Short description of a gene from UCSC database. Gene type: protein or RNA (not mRNA) coding. Position of variation in the gene: CDS or UTR, exon or intron, and whether a variation falls into a splice site, defined as two nucleotides at 5' and 3' ends of introns. Type of variation: synonymous, non-synonymous, stop-gain, stop-loss, insertion, deletion, multi-nucleotide, frameshift. Position of amino acid substitution caused by variation in translated protein. Total length of translated protein. Codon change in the gene caused by variation. Amino acid substitution in a protein. Tolerance score of a substitutions, calculated by algorithms similar with the SIFT  approach. The score is calculated based on occurrence of a substituted amino acid in a given position of alignment of a protein to homologs from the UniProt Knowledgebase or NCBI nr protein database. If the score is lower than a threshold (0.05), a variation is considered as damaged. Tolerance score cannot be calculated if a protein doesn’t have enough homologs. Items 5-14 are repeated for each SNP effected gene. Solovyev V, Kosarev P, Seledsov I, Vorobyev D. Automatic annotation of eukaryotic genes, pseudogenes and promoters. Genome Biol. 2006,7, Suppl 1: P. 10.1-10.12. Ng PC, Henikoff S. SIFT: predicting amino acid changes that affect protein function. Nucleic Acids Res. 2003 Jul 1;31(13):3812-4.
vcf - VCF4.0 VCF file contains meta-information lines (start with ##), a header line (starts with #CHROM), and then data lines each containing information about position of a variation in a genome. First column is a chromosome, second is position, fourth is a reference nucleotide, fifth is a observed non-reference nucleotide or a list of such nucleotides. In the current version, meta-information and header lines are ignored. annovar - ANNOVAR file format. First five columns: chromosome, start position, end position, reference nucleotides and observed nucleotides. For a SNP, start and end positions are identical. Other (optional) columns are ignored. annovar_h - ANNOVAR file format with zygosity information (sixth column). .
simple - simple ANNOVAR-like format most suitable for manual input of SNP data. Four columns: chromosome, position, reference nucleotide, observed nucleotide. 23andme - 23andMe file format. Header lines start with #. Four columns: ID, chromosome, position, observed nucleotides. References nucleotides for each variation are taken from reference genome sequence. cdr - VAAST file format. cdr stands for 'condenser format'. Such files are generated by VST program of VAAST package from sets of GVF files. reads_single - single-end reads in FASTQ format. reads_paired - paired-end reads in FASTQ format. Two input files must be specified, names are comma-separated without spaces. All SNP file formats are tab-delimited, but any sequence of tabs or spaces is considered as a column separator. A reference nucleotide is taken from a reference genome sequence, so any valid DNA nucleotide (A, C, G or T) is permitted in an SNP description string. All positions must correspond to GRCh37/hg19 genome assembly, and base numbering starts from 1. Variation location: Out of CDS, 3' UTR. Description: Homo sapiens frizzled-related protein (FRZB), mRNA. Comfiguration file name is snp.ini. Path to files with data are set in snp.ini in [global] section. Filtering parameters are set in [sift_score_filter] and [add_filters] sections. enabled=0 turns on SIFT score filter. show_only_scored=yes means ignoring variations without SIFT scores. If compare_less=0, SNPs with scores more than compare_level are printed in output file, compare_less=1 outputs SNPs with scores less than compare_level. Small values of SIFT score correspond to variations that are not dmaged. Usual cutoff level (compare_level) is 0.05. With coding_region only SNPs in coding region of genes are printed in output file. omim and snpedia options are for filtering only SNPs with information in OMIM database or SNPedia.